Yeah, so that's pretty much how my "Faux Barn Wood" painting tutorial is coming along. LOL. Don't worry, the actual panting technique will be speedy!... it's been all the PREP to get the wood even READY for the paint, that is taking forever! 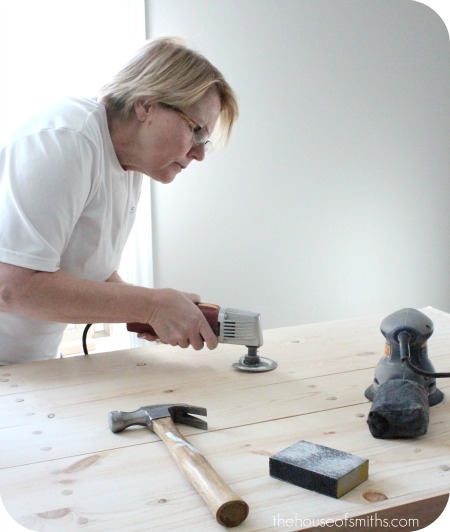 I was so desperate for help to get this tabletop to the point where I could at least start the first step of paint, that I even got my Mom in on the action. Pssst... Dad, you would have been SO proud! She totally OWNED that little saw! Honestly, it was the LAST thing we wanted to do, since we had just killed ourselves at the gym earlier that morning doing "The Shell-inator". (don't ask... I'll explain on Monday, when I do another weight loss post. ha!) 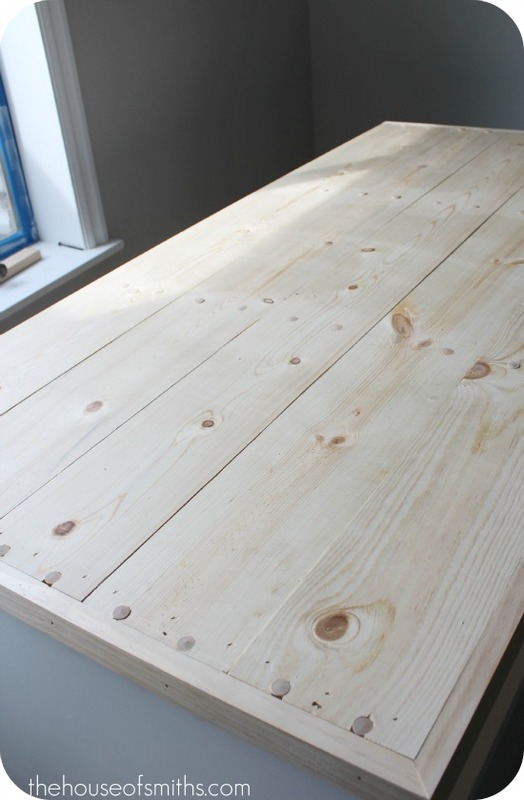 Our arms were already like spaghetti, and sanding down this planked wood surface, almost did us in. I'll definitely fill you in more later, when we do our entire "worktable post", but for now, just know that we've planked the top of this custom unit with 5 pieces of wood and drilled out some holes for a couple of different rows worth of wooden pegs, to give the tabletop a really special touch... kind of like an authentic old farmhouse table! Well, when we installed the pegs with some wood glue, we realized after they dried that a couple were sticking pretty high up, (too high for just sanding alone) so that's where my Mom came in. 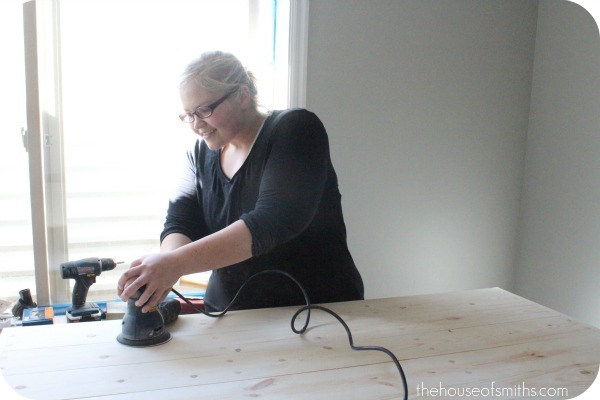 She used our vibrating multi-functional tool with the saw blade attachment and took the larger raised parts of those little pegs off, by carefully holding the saw flat against the table (so she wouldn't end up gouging any of the wood around it). PS. Have I mentioned how much I freakin' LOVE that multi-functional tool!? 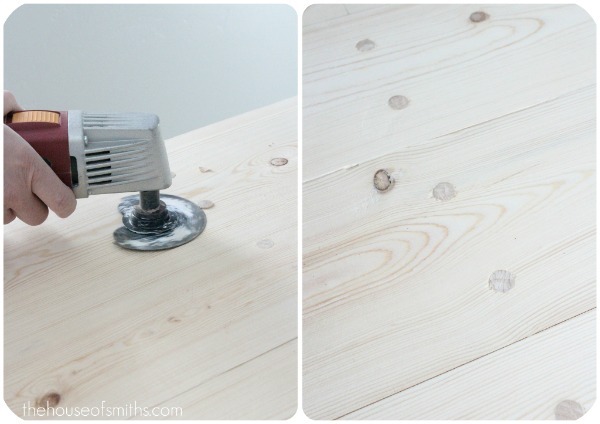 It's a HUGE time saver and always comes in handy during DIY projects big or small! After she was done leveling out all the wooden pegs, I went in with our orbital sander and sanded the snot out of that thing 2 or 3 times :) I'll be using this worktable for small craft projects, organizing papers and gathering ideas. So I wanted the top of the table to have lots of character, but also be mostly smooth, so that papers and such wouldn't catch on it. I can't even tell you HOW MUCH DUST was covering my office after we finished. ha! Good thing we covered all of my electronics with thick cloths. It took us about 3+ hours, just to get this portion of our project sanded and cleaned up, so I'm hoping that tomorrow or Friday I'll be able to start in on the painting process... YaHoo! I have to quickly express my undying love and appreciation for i-Phones and Facetime. To me, technology is so amazing, and sometimes it just blows my mind. 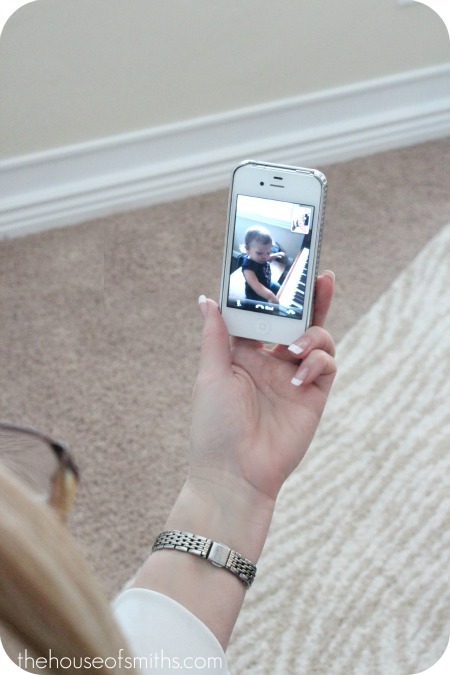 I can't believe that I can watch my adorable little niece (that I miss so much) plinking and sinking her ABC's away on the piano, in Arizona, all in the comfort of my OWN living room. I know we often take this stuff for granted, but for some reason I just felt the need to say how grateful I am for all the amazing technology we have in this world today...and of course it goes without saying, being able to connect with all of YOU fabulous people as well, definitely makes it into that "mind-blowing" category :) Thank you so much for reading along with us, we love sharing our story with you, and truly appreciate you letting US, be a part of your day. Hello skinny girl!! You look fabulous! the table is beautiful... but so are YOU! holy cow! you look awesome and so skinny!! you are an inspiration! I lost both my parents recently. Please treasure those awesome parents of yours! The memories of such unselfish service that they are giving you are absolutly priceless. I really like your blog, but those parents of yours are just incredible. Loving the tabletop Shelley..I am currently dreaming up solutions for my at-home garage turned painting studio/showroom...and I am having fun! I have my parents here from NZ at the moment so I am making the most of having my Dad here to help us out, he loves doing DIY projects, and I have plenty for him! Oh my gosh!!! Was I right??? Is this your desk? And by the way Shelley, you're looking a bit smaller in that picture. I don't know if you're still trying to lose weight, but it looks like it! Your table looks awesome. It's so great that your Mom helps with your projects. Your little neice is adorable. Farm table. Swoon. I bet I'm going to be just a tad bit jealous of this new room of yours. The iphone is WAY cool. I can visit with my son in New Mexico. I love that! As for the dust and sanding. I love the smell of the wood while it is being worked. Shelley, I has typed up an email to send you yesterday but something told me not to send it. I was going to ask you about how your weight loss journey is going! I can't wait to read about it on Monday! I have started a journey of my own on my own. I pray I stick with it and keep my drive! My motivation is The Color Run 5k. I wished you lived close, I would love for you to be there too! This is going to be AMAZING!! Can't wait to see the finished product! I can't wait to see the table! I'm sure it's going to look awesome! I have a old librarians desk in our office....it's a nice work space but no drawers...I"m looking forward to see how you organize all this- you, Ms. Queen of organization! Shelley, did you build a frame and then lay the slats inside for the table top. I just love the way it's coming out and want to get my hubby in on the action to help me out with one, but was looking for a little more direction. If you get the time please help. Thanks!!!! I LOVE reading your blog each day! I normally don't comment, and I am glad that you are going to do a separate working out post because I saw that picture of you and thought, "That girl looks so skinny!" Yeah for you! I totally love all your creative ideas, you rock! Shelley, you look GREAT! Looks like you're getting so small ;) Can't wait to see the finished office and hear of your fantastic weight loss! The pegs are going to give your desk a real farmhouse vibe. Looking forward to more progress photos as you get to it. Oh, and you have lovely nails for a sander-weilding girl. Love this table! I was hoping you would stain it. The pegs would just pop and look so lovely. If you don't, I'll have to make one too and stain mine! Just wanted to say your arms might have been dying, but you are really looking GREAT! Wow! Loved this post. Hey MOST of my projects are waaaay more time consuming than I thought they would be when I started. Can't wait to see the finished project! SHELLEY!!! Dang girl! All your hard work is paying OFF :) You look freakin' awesome! How much have you lost? Dying to hear your weight loss story! I was the one that had also lost 30 lbs and seeing bone in my collarbones! So can't wait to hear! that looks like it will be cool! i often say how appreciative i am of my iphone and technology. my 6 month old granddaughter already gets skype and i'm so happy i can see her on face time too! do you have a lot of problems with face time though? ours gets disconnected constantly! I just know that if we lived near each other that we'd be good friends! You always say the exact things that I think or say! "In my mind this was supposed to take an hour.... in reality it took 2 weeks...." It drives my husband nutso!! Can't wait to see the final result and tutorial!! You are seriously looking great! So proud of you! Girl you look amazing!!!! Your face is so thin! Your arms and middle is so much thinner too. Keep up the great work!!! !